This week Apple began accepting submissions for the upcoming Mac App Store, the OS X equivalent of the iOS iTunes based App Store. For Mac users this is a big deal; what Steam Powered has done for games, Apple is doing for Mac applications. This also means a big opportunity for people who never jumped on the iPhone developer train. And, you won’t have to dish out an extra $500-$3000 for a license like you used too. Sure, you want to earn some cash, or you have a great idea, or you just love Mac so much you want to marry it… I’m not going to spend a lot of time going over the reasons why you would want to develop, but rather look at what you get as a Mac developer. 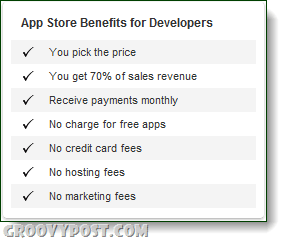 You keep 70% of all money made from sales, and you get a decent amount of control over the app. Apple doesn’t charge you any fees other than the annual subscription (and their 30% kiss). Consider also that a professional iOS developer can make anywhere between $100-$150 per hour building apps for third parties. Although the Mac and iOS are different platforms it has been projected that production costs will be similar. The store just launched, so now is your chance to have your app be the first of it’s kind. And, your apps will be in the app store, a place where they will be visible to a large audience rather than just a couple websites here and there. Read the Apps Store tips and guidelines so your hard work doesn’t get immediately rejected. That is all there is to it, really. If you need some tips with writing for the platform Apple already has in place a huge archive of guides that are available to anyone. Have you done any development for the iOS platform or Mac? We’d love to hear your experience in the comments below! this topic just like that I am looking for, I want where to get a selling service items list?